Philip Kaufman's Invasion of the Body Snatchers, the second Hollywood adaptation of Jack Finney's famous serialized novel, The Body Snatchers, was released in 1978, starring Donald Sutherland, Brooke Adams, Leonard Nimoy, Jeff Goldblum, and Veronica Cartwright. Despite a growing feeling in Hollywood circles that both sci-fi and horror were genres on the decline, 1978 turned out to be a banner year for both, with releases like Coma, Dawn of the Dead, Jaws 2, The Boys from Brazil, and of course Halloween all proving to be box office goldmines, not to mention the persistent earnings of the previous years' Star Wars. The behind-the-scenes story of the film is almost more interesting than the film itself, as it was shot mostly on location by a surprisingly small crew. Armed with a guerilla-style filmmaking ethos, Kaufman and his team bucked studio wishes and created a surprisingly artsy little film full of experimental shots, improvized takes, and a lot of sequences where they just followed Donald Sutherland walking around San Francisco with hidden cameras. I know this makes it sound like the kind of boring, pretentious, arthouse nonsense fans of the French New Wave would get excited about, but the film Kaufman delivered resonated incredibly well with audiences, earning not only seven times its budget in box office receipts but also a legacy as one of the greatest science-fiction remakes of all time. The reason for its success and continued pop culture relevance is fairly simple: it's the best version of the story. While moving the setting from a small town to a big city might seem like a giant change that should irreparably harm the source material, it works elegantly to expand upon Finney's original concepts and put them in a slightly different context. Finney's novel tries to turn the mundane into something more sinister, and in the novel, he uses elements of small town Americana that would otherwise seem quirky and charming and turns them on their head. 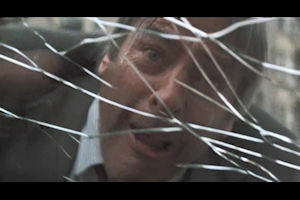 In Kaufman's adaptation, shots of city life are carefully chosen to highlight the many oddities going on in the background that people tend to ignore or take for granted, and these elements--almost subliminal on a first viewing--are geared toward exposing the sinister, dehumanizing aspects of urban society. Watch the background, especially during the first half of the film. Almost every single shot of the city has something odd and unexplained going on, and a lot of those weird events are entirely real, captured by the guerilla filmmaking Kaufman employed. (The filmmakers also had fun planting a special fluff to be shown in the background without fanfare all over town, revealed in the film to be the remains of humans who have been turned.) But even the scripted scenes are shot to be off-kilter and unsettling, with odd lighting and unusual camera placements, like an early domestic conversation filmed from around the corner and down the hall so you can only catch glimpses of the people talking through blurry reflections. 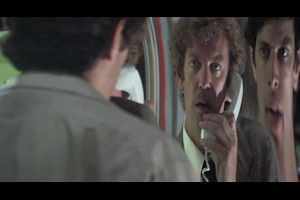 One of my personal favorite examples is in a crowded party scene, where we are introduced to Jack (played by a young Jeff Goldblum) as he jabbers over the shoulder of Dr. Bennell (Donald Sutherland), who is trying to talk to the police on the phone, and the camera is placed in such a way that we only really see Jack reflected in a funhouse-style mirror, with his rudely incessant mouth expanded to twice the size of the rest of his face. This demonstrates the duality of the filmmaking at work here. The on-location shooting, long takes, methodical approach, handheld camera work, and naturalistic dialogue all lend themselves to a very grounded, realistic feel, something films of the seventies excelled at. However, the awkward camera placements, the spinning Dutch angle shots, the heavy, noir-style use of churiascuro, the subtle formalistic touches (the glowing, isolated light on that first seed pod comes to mind), and the unsettling, noisy soundtrack (which works brilliantly to build tension, but occasionally gets carried away with itself to become unforgivably distracting) are tools of a more surreal style of film. These two opposing approaches to filmmaking should clash horribly, but they don't. Instead, they complement the ideas and themes of the story in unique and fascinating ways, revealing a world that can seem mundane on the surface but disturbingly fantastic just underneath. The story, despite a few superficial cosmetic changes, is remarkably similar to both Finney's novel and the 1956 film. Many of the basic plot beats are there, with Dr. Bennell and his love interest, Miss Driscoll (Becky in the previous versions, Elizabeth in this one, played by Brooke Adams), slowly uncovering a plot by alien seed pods to replace everyone with emotionless copies. The pair are helped along by their friend Jack, who comes across a half-formed copy of himself. 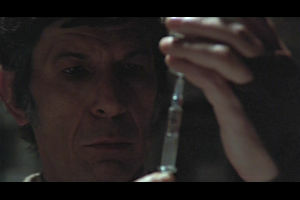 Dr. Bennell then saves Elizabeth from being copied in her own home, and then the pair meet up with Jack, his wife, and a skeptical psychiatrist (Leonard Nimoy in a memorable turn as a pop-psych hippy shrink) to try and figure out what to do, only to find themselves all in danger of being replicated when they begin to fall asleep. Forced to flee, the group separates, and Dr. Bennell and Elizabeth hole up in the doctor's place of work where, through a window, they witness pod people shipping more pods to nearby cities in order to spread the invasion. They are caught shortly thereafter and nearly turned once again before making a desperate escape. The characters are a little different, to be sure. Dr. Bennell and Elizabeth are both employees at the San Francisco Health Department, and instead of being two people who've been through separate divorces learning to connect with one another to overcome mutual heartbreak, Elizabeth is in a relationship with another man, Geoffrey (the first person shown to be transformed by the pods, who acts in many ways like her father did in previous versions), and Dr. Bennell is her loyal friend who is not-so-secretly infatuated with her. (Incidentally, the chemistry between Sutherland and Adams, despite an off-putting fourteen-year age difference, feels genuine and charming; they have the chemistry McCarthy and Wynter lack.) Jack is still a writer, but this time, his wife, Nancy (Veronica Cartwright), operates a mudbath parlour. There are other differences, too, but these are relatively minor in the grand scheme of things, as the narrative and its core concepts remain intact. Even a few parts of the novel that failed to make their way into the 1956 version are here. Dr. Bennell has a fascination with clipping odd articles from newspapers (a trait that belonged to Jack in the novel), and the book climaxes with his attempt to take down a farm where pods are being grown en masse. However, like in the 1956 version, Jack is one of the pod people who captures the pair in Dr. Bennell's office, Elizabeth turns right before the end, and then Dr. Bennell is forced to run on his own. Then the ending happens, and of all the different versions of the tale, including the novel and all four major film adaptations, this has the single best and most fitting conclusion of them all, and even though I've spoiled pretty much everything else about the story, I won't spoil that. No discussion of this film would be complete without at least mentioning the special effects. 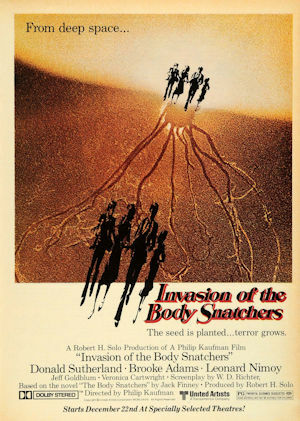 Like the 1956 adaptation before it, 1978's Invasion of the Body Snatchers wasn't given a lot of money by the studios, who wrongly assumed it wouldn't do particularly well at the box office, and a large percentage of the budget went to the cast, leaving precious little for the effects. Thankfully, this was before CGI completely overtook the industry, so filmmakers still understood the value of ambitious practical work, even on a thinly stretched checkbook. Not only are the pod transformations startlingly good, but there's some make-up work that stands out, revealing how, as a copy grows, the original body starts to decay. Lips become chapped and flaky; skin dies and falls away; and people start looking sick and gaunt. It's not a flawless movie, of course. Revealing Dr. Kibner to be a pod person so early removes some of the suspense and surprise of the story; the acting from most of the pod people is too stilted to be believable, especially from Art Hindle's Geoffrey, who is cartoonishly wooden; some of the stylistic touches are horribly dated by modern standards; and impatient viewers might get turned off by the deliberately slow first act. However, none of that should take away from what is a genuinely disturbing and incredibly special little film that doesn't deserve to be overlooked. A year after its release, it was overshadowed by Ridley Scott's seminal masterpiece, Alien, a film that shares a lot of DNA (not to mention Veronica Cartwright) with 1978's Invasion of the Body Snatchers, and that was the film that finally put a stop to all the Hollywood talk about the end of horror and science-fiction. But that's a subject for another day. Come back next week, when we'll look at the less successful 1993 adaptation, called Body Snatchers, the version Roger Ebert repeatedly claimed is the best. Let's just say I have a few things to say about that.